We’re celebrating 30 years of Realtree turkey hunting this season (1986-2016). This feature article first appeared back in 2001 as “Turkey Hunting Safety,” a chapter in the Team Realtree Turkey Hunting Fieldbook. Written by the late Aaron Pass, and as the title suggests, it contains cautionary advice to help turkey hunters stay safe. Some of it might even seem overly cautious. That said, in the 15 years since this original writing, trends have turned toward fanning tactics, the strategy of using a turkey tail – or full-bodied gobbler decoy with a fan – to pull other male turkeys into range. You do it by moving toward live birds and triggering their attention. When it works, gobblers run to the fan or decoy as the hunter crawls behind it. It’s illegal in some states, such as Pennsylvania, where spring turkey hunting is required by calling only and not stalking. Fanning, as Bill Konway’s excellent photos show, could surely be deemed unsafe in certain situations. In the end, turkey-hunting safety advice can only be shared and encouraged...especially to young hunters or to those new to the tradition. The recipe for a spring turkey-hunting accident is simple. 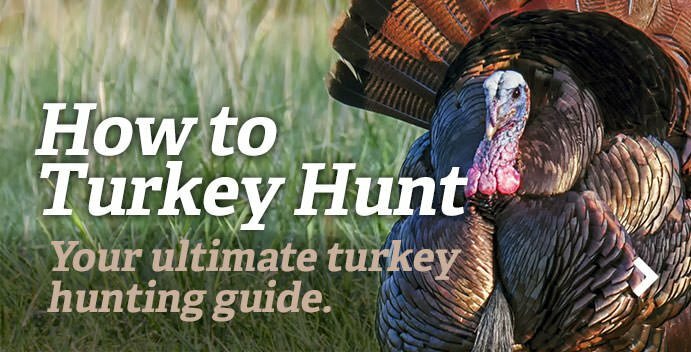 Take a lot of overeager hunters, dress them in state-of-the-art-camouflage, and equip them with realistic sounding turkey calls and loaded guns. Scatter them liberally through the spring woods; then season with a highly competitive spirit. Add a dash of predawn light and a sprinkle of “turkey fever” jitters. The stage is set for misadventure. Such is not an unreasonably overdramatized scenario of the opening day of spring turkey season on many public and some private hunting lands. Basic safety principles and some special turkey hunting safety techniques can make the rites of spring much safer. A simple document called “Ten Commandments of Firearms Safety” is often packed with new guns and distributed in hunter safety courses. It is the “Bible” of good gun handling and safety practices. Turkey hunters should pay particular attention to Commandment No. 4: Be sure of your target and what is beyond it before you pull the trigger. It seems ridiculous to think that a human being could be mistaken for a turkey. However, that is the leading cause of turkey hunting accidents. Don’t make a target of yourself. Given a gobbler’s keen eyesight and wary disposition, stalking offers low odds for success and exposes the stalker to considerable danger. If it becomes necessary to change calling position, do so with caution. If possible, use established trails or woods roads and move briskly in an upright human posture. Don’t sneak through shrubbery tempting other hunters to think you are a turkey rather than a hunter. Not only are these the colors of a gobbler’s head, the gobbler’s head is also the preferred target for an effective shot. Uncovered skin and white tee shirts are prime offenders, but sock tops or long underwear exposed if your pants ride up, and red or blue handkerchiefs are also potential problems. This provides a shot-proof barrier covering your entire back and with a view 180 degrees to your front. While this is not always possible, in most circumstances you can find a set-up spot that provides you with protection. Turkeys and humans sound quite similar walking in the leaves, and thanks to modern turkey call technology, the average hunter does not have to be a contest champion to call like a turkey. If you see someone approaching, sit still and speak loudly. If you are set up and calling and see someone approaching your position, do not assume that he sees you as another turkey hunter. Modern camouflage is incredibly good. Such sound or movement could cause you to be mistaken for a turkey. If you elect to gobble, be extremely cautious. Calling like a gobbler is sometimes an effective hunting tactic, but using a gobbler call can also attract other hunters. In a sense, you are making yourself the target of other hunters’ attention. Be 100 percent sure of your target before you pull the trigger. Remember Commandment No. 4. You can never call your shot back. Like the use of a gobbler call, decoys are effective...but can put the user at potential risk. Obviously, if a decoy can fool a sharp-eyed gobbler, it can fool another hunter. More than one decoy has drawn fire from an intruder into the decoy user’s hunting area. Hunters should observe rigorous safety practices when using decoys. Always carry a decoy covered in the cargo bag of your vest. Never give in to the temptation to carry an exposed turkey decoy “just a few yards” while hunting. Don’t place the decoy too close to your position. Always place the decoy so that you have a good view past the decoy in a direct line from your position. Perhaps we should redefine our contemporary concept of turkey hunting success and brush up on our ethics and sportsmanship in the interest of safety. Are we too competitive? Will we leave the early bird to his worm when we discover another hunter’s vehicle already parked at “our” hunting spot? Will we break off and slip away if we discover another hunter working a gobbling turkey? Ethics, sportsmanship, and safety considerations provide us with the answers and should be recognized as integral parts of safe hunting. Go here for more Realtree turkey hunting tips.